The evolution of flagella is of great interest to biologists because the three known varieties of flagella (eukaryotic, bacterial, and archaeal) each represent a sophisticated cellular structure that requires the interaction of many different systems. 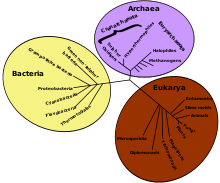 There are two competing groups of models for the evolutionary origin of the eukaryotic flagellum (referred to as cilium below to distinguish it from its bacterial counterpart). Recent studies on the microtubule organizing center (MTOC) suggest that the most recent ancestor of all eukaryotes already had a complex flagellar apparatus. These models argue that cilia developed from pre-existing components of the eukaryotic cytoskeleton (which has tubulin and dynein – also used for other functions) as an extension of the mitotic spindle apparatus. The connection can still be seen, first in the various early-branching single-celled eukaryotes that have a microtubule basal body, where microtubules on one end form a spindle-like cone around the nucleus, while microtubules on the other end point away from the cell and form the cilium. A further connection is that the centriole, involved in the formation of the mitotic spindle in many (but not all) eukaryotes, is homologous to the cilium, and in many cases is the basal body from which the cilium grows. These models argue that the cilium evolved from a symbiotic spirochete that attached to a primitive eukaryote or archaebacterium (archaea). The modern version of the hypothesis was first proposed by Lynn Margulis. The hypothesis, though very well publicized, was never widely accepted by the experts, in contrast to Margulis' arguments for the symbiotic origin of mitochondria and chloroplasts. Margulis did strongly promote and publish versions of this hypothesis until the end of her life. The primary point in favor of the symbiotic hypothesis is that there are eukaryotes that use symbiotic spirochetes as their motility organelles (some parabasalids inside termite guts, such as Mixotricha and Trichonympha). While this is an example of co-option and the flexibility of biological systems, none of the proposed homologies that have been reported between cilia and spirochetes have stood up to further scrutiny. The homology of tubulin to the bacterial replication and cytoskeletal protein FtsZ is a major argument against Margulis, as FtsZ alike protein (see Prokaryotic cytoskeleton) is apparently found natively in archaea, providing an endogenous ancestor to tubulin (as opposed to Margulis' hypothesis, that an archaea acquired tubulin from a symbiotic spirochete). All currently known nonflagellar Type III transport systems serve the function of injecting toxin into eukaryotic cells. It is hypothesised that the flagellum evolved from the type three secretory system. For example, the bubonic plague bacterium Yersinia pestis has an organelle assembly very similar to a complex flagellum, except that is missing only a few flagellar mechanisms and functions, such as a needle to inject toxins into other cells. The hypothesis that the flagellum evolved from the type three secretory system has been challenged by recent phylogenetic research that strongly suggests the type three secretory system evolved from the flagellum through a series of gene deletions. As such, the type three secretory system supports the hypothesis that the flagellum evolved from a simpler bacterial secretion system. Eubacterial flagellum is a multifunctional organelle, and it is one of the two fundamental subdivisions of prokaryotes. It’s also one of a range of motility systems in bacteria. The structure of the organelle appears like a motor, shaft and a propeller. However, the structure of eubacteria varies based on whether their motor systems run on protons or sodium, and on the complexity of the flagellar whip. The evolutionary process of Eubacterial flagellum is probably an example of indirect evolution. A hypothesis on the evolutionary pathway of eubacterial flagellum argues that, a secretory system evolved first, based around the SMC rod- and pore-forming complex. This is presumed to be the common ancestor of the type-III secretory system and the flagellar system. Then, an ion pump was introduced to this structure which improved secretion. The ion pump later became the motor protein. This was followed by the emergence of the proto-flagellar filament as part of the protein-secretion structure. Gliding-twitching motility arose at this stage or later and was then refined into swimming motility. The recently elucidated archaeal flagellum is analogous, not homologous, to the bacterial one. In addition to no sequence similarity being detected between the genes of the two systems, the archaeal flagellum appears to grow at the base rather than the tip, and is about 15 nanometers (nm) in diameter rather than 20. Sequence comparison indicates that the archaeal flagellum is homologous to Type IV pili. (pili are filamentous structures outside the cell). Interestingly, some Type IV pili can retract. Pilus retraction provides the driving force for a different form of bacterial motility called "twitching" or "social gliding" which allows bacterial cells to crawl along a surface. Thus Type IV pili can, in different bacteria, promote either swimming or crawling. Type IV pili are assembled through the Type II transport system. So far, no species of bacteria is known to use its Type IV pili for both swimming and crawling. Testable outlines exist for the origin of each of the three motility systems, and avenues for further research are clear; for prokaryotes, these avenues include the study of secretion systems in free-living, nonvirulent prokaryotes. In eukaryotes, the mechanisms of both mitosis and cilial construction, including the key role of the centriole, need to be much better understood. A detailed survey of the various nonmotile appendages found in eukaryotes is also necessary. 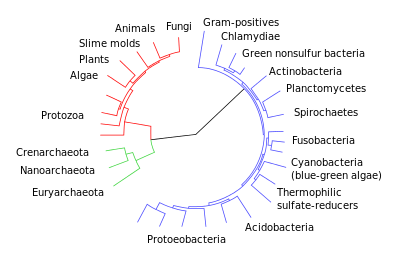 Finally, the study of the origin of all of these systems would benefit greatly from a resolution of the questions surrounding deep phylogeny, as to what are the most deeply branching organisms in each domain, and what are the interrelationships between the domains. ↑ Yubuki, N., & Leander, B. S. (2013). Evolution of microtubule organizing centers across the tree of eukaryotes. The Plant Journal, 75(2), 230-244. ↑ Gibbons IR (1995). "Dynein family of motor proteins: present status and future questions". Cell Motility and the Cytoskeleton. 32 (2): 136–44. doi:10.1002/cm.970320214. PMID 8681396. ↑ Asai DJ, Koonce MP (May 2001). "The dynein heavy chain: structure, mechanics and evolution". Trends in Cell Biology. 11 (5): 196–202. doi:10.1016/S0962-8924(01)01970-5. PMID 11316608. ↑ Margulis, Lynn (1998). Symbiotic planet: a new look at evolution. New York: Basic Books. ISBN 978-0-465-07271-2. OCLC 39700477. 1 2 Young, Matt & Edis, Taner (2004). Why Intelligent Design Fails: A Scientific Critique of the New Creationism ISBN 0-8135-3433-X Rutgers University press New Brunswick, New Jersey, and London.72-84. ↑ Berry, R. M., and J. P. Armitage. 1999. "The Bacterial Flagella Motor." Advances in Microbial Physiology ISBN 978-0-12-027749-0. v. 49: 291–337. ↑ Faguy DM, Jarrell KF, Kuzio J, Kalmokoff ML (January 1994). "Molecular analysis of archael flagellins: similarity to the type IV pilin-transport superfamily widespread in bacteria". Canadian Journal of Microbiology. 40 (1): 67–71. doi:10.1139/m94-011. PMID 7908603. Wong, Tim; Amidi, Arezou; Dodds, Alexandra; Siddiqi, Sara; Wang, Jing; Yep, Tracy; Tamang, Dorjee G.; Saier, Milton H. (2007). "Evolution of the Bacterial Flagellum: Cumulative evidence indicates that flagella developed as modular systems, with many components deriving from other systems" (PDF). Microbe. 2 (7): 335–40. Jones, Dan (16 February 2008). "Uncovering the evolution of the bacterial flagellum". New Scientist. Retrieved 1 December 2009. Hall JL, Ramanis Z, Luck DJ (October 1989). "Basal body/centriolar DNA: molecular genetic studies in Chlamydomonas". Cell. 59 (1): 121–32. doi:10.1016/0092-8674(89)90875-1. PMID 2571418. Pallen MJ, Matzke NJ (October 2006). "From The Origin of Species to the origin of bacterial flagella". Nature Reviews. Microbiology. 4 (10): 784–90. doi:10.1038/nrmicro1493. PMID 16953248. Margulis, Lynn (1981). Symbiosis in cell evolution: life and its environment on the early Earth. San Francisco: W. H. Freeman. ISBN 978-0-7167-1255-8. OCLC 6982472. Margulis L (April 1993). "The Inheritance of Acquired Microbes" (PDF). Citation Classic Commentaries. 36 (16): 9–10. Matzke NJ (September 2006). "Evolution in (Brownian) space: a model for the origin of the bacterial flagellum". Talk Reason. Retrieved 1 December 2009.